Follows & Bate of Gorton, Manchester, England is one of the most famous lawn mower manufacturers. The company was started in 1868 by Frederick William Follows who saw the potential for a small, mass produced lawn mower for the domestic market. The Climax model that was introduced by the company the year after its foundation was the first side wheel mower. 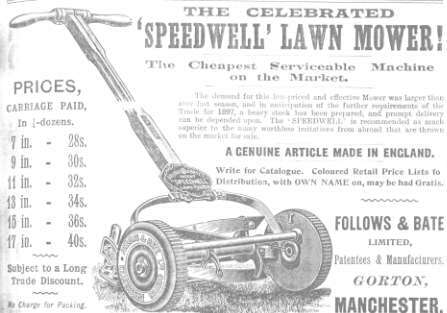 The mower was still being promoted as late as the 1930s, albeit as an improved version. Despite this longevity, examples of the Speedwell are relatively unusual today and they are prized among collectors. Follows & Bate continued to manufacture a wide range of machines until it was taken over by Qualcast in 1938. Inexpensive mowers with the 'Folbate' name were produced by Qualcast until 1966.